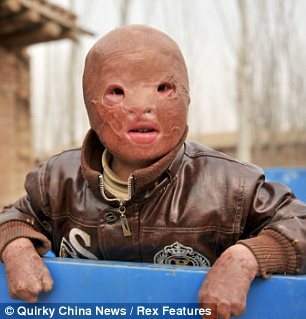 A Chinese boy left trapped behind a mask of scar tissue after a fire burned his face and hands off is to get the first of a dozen operations to try and restore some of his features. Wang Xiaopeng has an almost featureless face after the horrific accident two years ago. His parents spent all their savings and took out loans to pay for three months of treatment but cannot afford to pay for any further surgery. Mail Online readers around the world were shocked to read of the young boy’s plight and called for a fund to be set up to help him. In response a special appeal has been created by the British charity Journalism Without Borders, who will make sure donations will go towards the youngster’s medical bills. 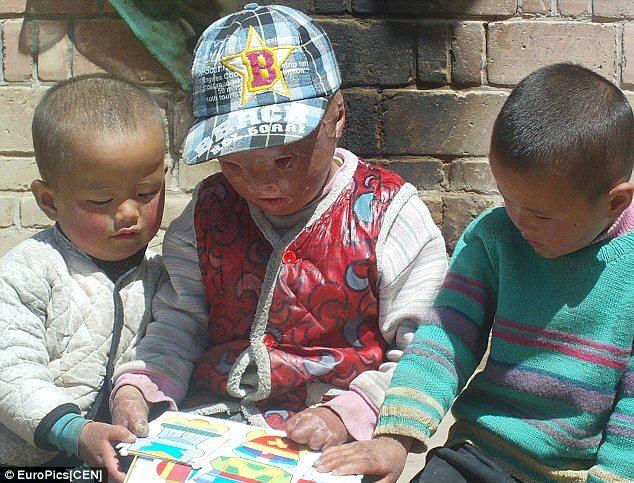 The five-year-old has been without hair, lips, eyelids, and toes since an accident in November 2010. He went up in flames after he accidentally set light to some corn stalks near his home in Yinchuan in China’s Ningxia Province. 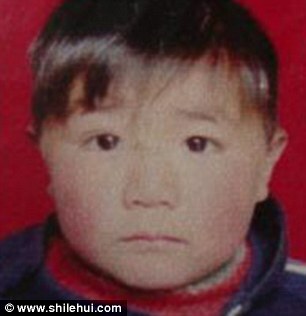 His parents rushed him to Ningxia Medical University General Hospital where he managed to pull through. However, he was left severely disfigured and the couple could only afford to pay for three months of treatment for their beloved son. They spent their life savings and sold their house and land to cover the 150,000 yuan bill – equivalent to around £15,000. They now live on a tiny plot of 0.2 hectares. His father Wang Yougiu, 32, earns just £200 (2,000 yuan) a month as a dairy farmer, while his mother Zhengwei Xiu, 30, is a housewife. Xiaopeng’s injuries make it difficult for him to see while all of his fingers were amputated from the second joint. He does not go to school, as no schools will admit him, and he only has a few friends who have got used to his appearance. Now at last there is good news for the young boy after Journalism Without Borders set up an appeal to pay for his medical care. A journalist from the British charity Journalism Without Borders said: ‘This is the best campaign we’ve ever had, with thousands of people donating small but significant amounts. Doctor Li Jinning, from Ningxia Medical University hospital, said Xiaopeng needed a minimum of three surgeries to get an at least ‘human’ look and probably much more to do a proper job. Although a Communist country, China does not have a cradle-to-grave free-at-the-point of use healthcare system. Instead around half of the population buy basic medical insurance which covers for half the costs of their healthcare. The remainder is paid either by patients or their health insurer. However, this leaves the poorest in China struggling to meet medical bills for serious condition like Xiaopeng’s.